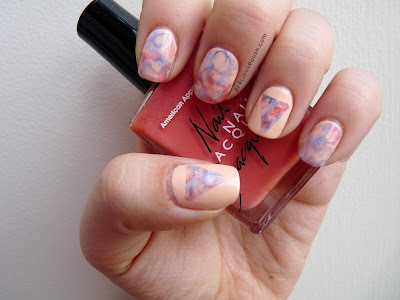 This manicure is one that I'm particularly fond of. I wanted to try out one of my recent purchases, American Apparel Imperial Purple. It's a beautiful deep, purple-blue shade that was opaque in an easy two coats. On top of that I did some bright ditsy floral accent nails. I painted American Apparel Imperial Purple on all of my nails. 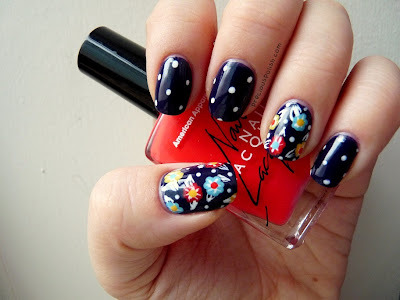 I used dotting tools in various sizes to make the flowers and polka dots with American Apparel Poppy, American Apparel The Valley, American Apparel Manila and American Apparel T-Shirt. I used a striping brush to draw on the leaves and the white parts of the petals. So now that December's here I think it's time to start doing some holiday nail art. Stay tuned!